Teriyaki has always been one of my favorite meals to go out for. Usually lunch, but on a rare occasion dinner. It's not fancy food, and in the Seattle area they are like Starbucks, 2 on every corner. And each shop is just a little different than the last one. This one might have Chicken Katsu, that one might have a thicker sauce.....the differences go on and on. 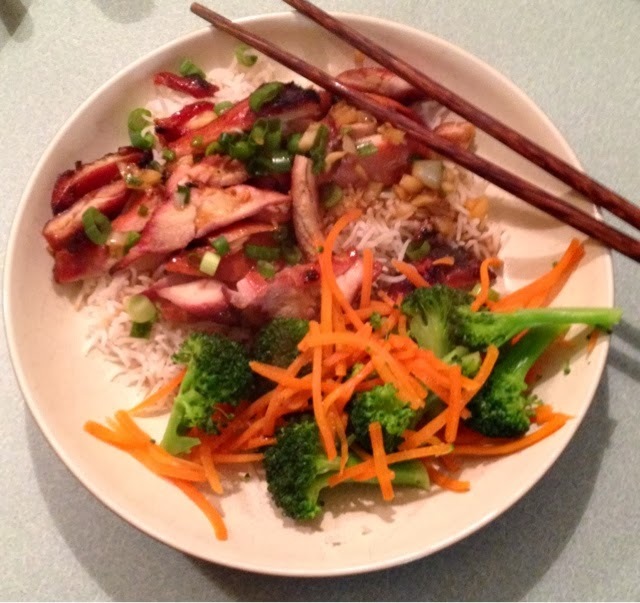 Well I've tried to make teriyaki at home and it's good, but jut not the same, until last nights creation. Remember to keep food safe. If you'd like the teriyaki sauce to serve over the ice be sure to reserve some before marinating the chicken. Also when grilling the chicken I baste one side while the other is cooking, flip and baste once then stop using the marinade. Always check the temperature of your chicken, with a food grade thermometer, to ensure it is cooked. At 160°F, the chicken is 100% cooked, but will still be a little pink. If you want a less pink aim for 170°-180° But remember the higher the temperature, the dryer the chicken. I typically cook my chicken to about 165°, and allow to rest before cutting. The chicken will continue to cook a little one it's off the grill. So the pinkness will go away, but the meat is still juicy. Trim chicken of any fat. In a large bowl, mix soy sauce, water, brown sugar, onions, garlic, sesame oil, and coconut milk. Mix well and pull 3/4 cup aside, BEFORE MEXT STEP. Grill chicken until chicken is cooked through, switching sides half way through. Basting chicken with marinade while cooking. Stop using marinade after you flip the chicken. This is for food safety concerns. The marinade has chicken juices in it and you want to cook the chicken and sauce thoroughly before serving. Do not reuse the marinade. Serve over rice, garnished with green onions and pour reserved marinade over rice. Optional rice variance: To make coconut rice: Replace half of the water in your rice recipe with coconut milk.